Red-shouldered hawk is renowned as the most vocal amongst all American hawks. This extremely vocal bird is almost an apex predator. Some species of birds do prey on other birds’ eggs. Sometimes eggs of red-shouldered hawks are also being preyed of this bird. 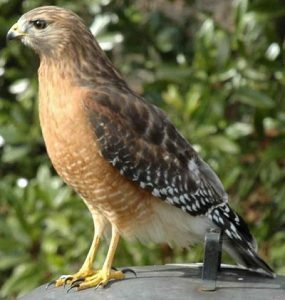 Red-shouldered hawks are often confused with red-tailed hawks. Find the description and identify the bird rightly next time. Size : Males are about 17 inches to 23 inches long. Females are about between 19 inches to 24 inches long. Weight : Males weigh around 550 g. Females weigh about 700 g.
Wings : Males have a 38 inch wingspan. Females have almost 41 inch wingspan. Color : Their shoulders are red, which they are being named after. Their heads are brownish, chests have red tinge. Their underneath parts are pale colored with some red bars on them. They have long tails with fine white colored bars on them. Their legs are long and yellow colored. This species of hawks have some peculiar behavioral traits apart from the common ones like other hawks. Read below and find out all about their behavioral characteristic. These birds are monogamous throughout their lifetime. They are territorial in nature. Their breeding season start from January and continue till June. These birds use the same nest over and over again for breeding. To protect their eggs from being eaten up by American crow these birds befriend and co-exist with them peacefully. They scream in a very loud note which can be heard from miles away. They fly very fast and quite high above in sky. They watch on their prey from high above the tree tops. As soon as they get them in favorable position they swoop down, catch them and fly away. During courtship these birds screech in a monotonous “kee-yer” tone. Their scream could be heard from distance of miles. They also call out in a typical whistling sound. These birds have a reputation of being the most vocal ones amongst all types of American hawks. The red-shouldered hawks are very fast flyers. They fly at a speed ranging between 18 MPH and 34 MPH. Red-shouldered hawks are carnivorous. They are preying birds. They mainly feed on small mammals, voles, chipmunks, small reptiles, amphibians, small birds, bigger bugs, etc. These birds wait for their prey and as soon as they find the prey in suitable position they swoop down, catch them by their claws and fly away. 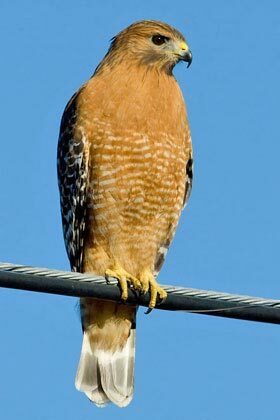 Red-shouldered hawks are widely distributed all over south-east of Canada, east of United States of America, central parts of Mexico and eastern Texas. Red-shouldered hawks tend to nest high above the tree tops. They find their hubs in deciduous forests neighboring water bodies and other wetlands. They also inhabit deciduous-conifer mixed woodlands. These birds start their spring season migration from February beginning and continue till first half of April. During this season they inhabit the eastern coastal regions and Great Lakes. The fall migration starts from middle of October and continues till middle of November. Most common migratory hub of the red-shouldered hawks are Appalachians, south of New England, south of Great Lakes zone, mid-Atlantic coastal areas, Marin Headlands and some of the races are marked towards further south. Red-shouldered hawks have few predators. They come under almost the grade of apex predators. They are mostly preyed by humans, fond of bird hunting. In the animal kingdom, their biggest predators are eagles. American crows are the most common threat to eggs of these birds. These birds have many adaptive features, both physical and behavioral. Read and find out all about their adaptive features and nature. Their vision is very powerful. They can trace their prey or predator from quite a distance. They can keep soaring for long time span due to their broad wings. Thus they can save themselves from being preyed from quadruped animals on land. The red-shouldered hawks make peace with American crows, which are known to be the worst predators of other birds’ eggs. The red-shouldered hawks mate from end of January till end of June. The peak mating season is throughout March till the beginning of April. This species of hawks are monogamous creatures. They build their cup shaped nests with sticks, Spanish moss, dry leaves, feathers, lichens, etc. on a height of 20ft. to 60 ft. above the ground. Females of this species lay about 3 eggs each season, sometimes the number goes up to 6 also. The eggs are white in color with some brown-ish yellow blotches on them. After a time span of 20 days to 33 days the hatchlings come out. The nascent born red-shouldered hawks are blind, weak and helpless. They leave their nests after a period 39 days to 45 days. But the hatchlings stay dependent on the parent hawks for food ad protection till 17 weeks to 19 weeks of age. 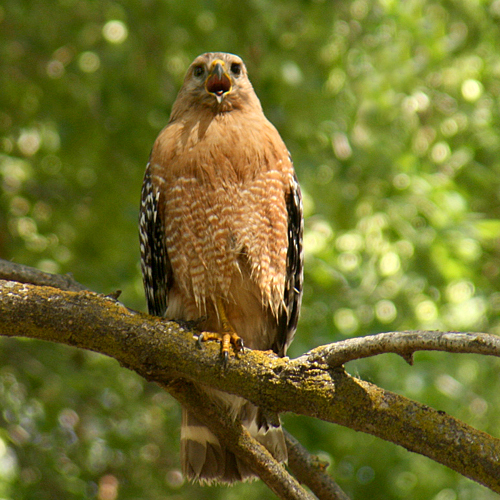 The red-shouldered hawks have been recorded to live for about 5 years in the wild. In captivity they have been observed to live for more than 12 years also. This species hawks are usually not petted. In case someone really wants to pet one of these birds is suggested to consult the state laws regarding petting this hawk. Experts’ suggestion is also advised to be followed about caring for them. 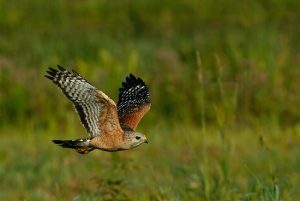 According to IUCN reports the red-shouldered hawks are Last Concerned. Their habitat conditions are absolutely safe and fine adaptive features have preserved the species’ existence intact on earth. It is unlikely to get endangered in recent future also. There are five sub-species of this species of hawks. These sub-species differ from each other in color and distribution range. Read the key points about red-shouldered hawks which are the most interesting also about them. These birds call out so loud that they have earned the name to of America’s most vocal hawk. They are monogamous in breeding nature. They repeat the same nest as the location for breeding. These birds are clever enough to befriend the worst of their predators, American crow, to save their eggs being eaten up by them. They are very fast flyers. They can soar for a long duration of time which helps them in tracing prey, predators and keep themselves from them. Check out this amazing bird in the pictures below. Can red shouldered hawks carry off a small domestic animal such as a small Yorkie that weighs under 4 pounds? We have a large population of hawks near our home. They make me nervous soaring over our yard since we have 3 small dogs that range from 3-8 pounds. Do I have reason to be concerned & is there anything I can do to safeguard the dogs from being preyed on by these birds?